2011 marks the 400th anniversary of the death of famed Spanish Renaissance composer Tomás Luis de Victoria. Arguably the finest composer of Spain’s Golden Age, the famed polyphonist is frequently compared to Palestrina and Lassus and is equal to their greatest achievements. Ensemble Plus Ultra has newly recorded 93 works by Victoria to honor this anniversary, and Deutsche Grammophon & Archiv Produktion released this monumental 10-CD box set on September 27, 2011. 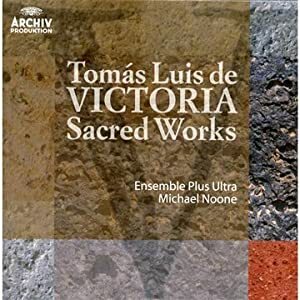 Though Victoria may not be as well known today as in the 16th century, Ensemble Plus Ultra and these new recordings afford the opportunity for a sizeable reassessment of his work. The group has been dedicated since its foundation in 2001 to the music of the glorious Spanish Renaissance and after ten years has a strong history of performing and recording this music. On this series of 10 CDs, brought together in one box, 42 musicians from more than five countries have come together to record 93 works by Victoria. The entire venture took more than 70 days of rehearsals and recording and resulted in 11.5 hours of newly recorded Masses, Lamentations, Motets, Magnificats and more. For this project the group chose to focus on the more than 25 years Victoria spent in Madrid during which time he published more than half of his compositional output. All of the works in his landmark publication of 1600, the Missae, Magnificat, motecta, psalmi et alia quam plurima published by the royal printer, Juan de Flandes, have been included in this set. In addition, there are recordings of many works by Victoria that are found only in manuscripts and have been specially edited for this project and that have never before been recorded. Highlights in this category include the nine lamentations that are preserved in a Sistine Chapel manuscript and the 12 works (including three masses and six magnificats) from a manuscript choirbook at Toledo cathedral. Other previously unrecorded masterworks include Bovicelli’s extraordinary virtuosic arrangement of Victoria’s Vadam et circuibo and a large number of ‘alternatim’ works featuring verses for organ, plainsong and wind instruments.